About a month ago I saw a super cool post about some of the insanely awesome entries in the Gowanus Studio jello competition, these people have done things with Jello I could have never dreamed of. I think my favorite entry was the jelloware by The Way We See the World; who wouldn't want to use those at their next party! So a couple of weeks ago when I was browsing the baking aisle at the grocery store and stumbled upon a box of Knox gelatine, I knew I had to get my jiggle on. After looking online I decided to put my gelatine to great use as gummy bears!!!! Well not exactly bears, but gummy candy, either way AWESOME! 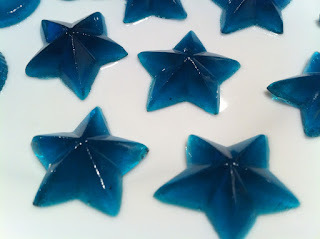 My research revealed that the most common way to make the homemade gummies is with flavored Jello and additional gelatine, but I also found a recipe for a more natural version that used 100% fruit juice and additional gelatine. I definitely wanted to give both versions a try, and I have to admit one version was a bit more successful than the other. I hesitate to say that I had some minor failures along the gummy journey, but I definitely did. My first batch of the juice version went south when I got distracted for 30 seconds (seriously, just 30 seconds) while I was messing around online, my concentrated juice went from a nice Passion Fruit syrup to a black charcoal mess and a house filled with a thick stinky smoke. Oh the disappointment, my dreams of chewy yumminess were quickly going down the drain. So I decided to give the Jello version a try while my destroyed All-Clad pot was soaking. This recipe was so simple and quick, I highly recommend it to anyone wanting to make something fun and yummy with kids. I chose to use the blue raspberry flavor Jello and they turned out really well. So after a successful batch of the Jello version and a good soaking of my pot I decided to give the juice version another try, this time with berry juice. The "glob" was a bit more temperamental than the Jello version but it worked itself out. The taste on the other hand was unfortunately not that great, they definitely had a weird burnt taste. I'm not sure if this is due to the type of juice I used or because of how long I cooked the juice down, but I'm sure with some tinkering this version could be just as good or even better than the Jello version.